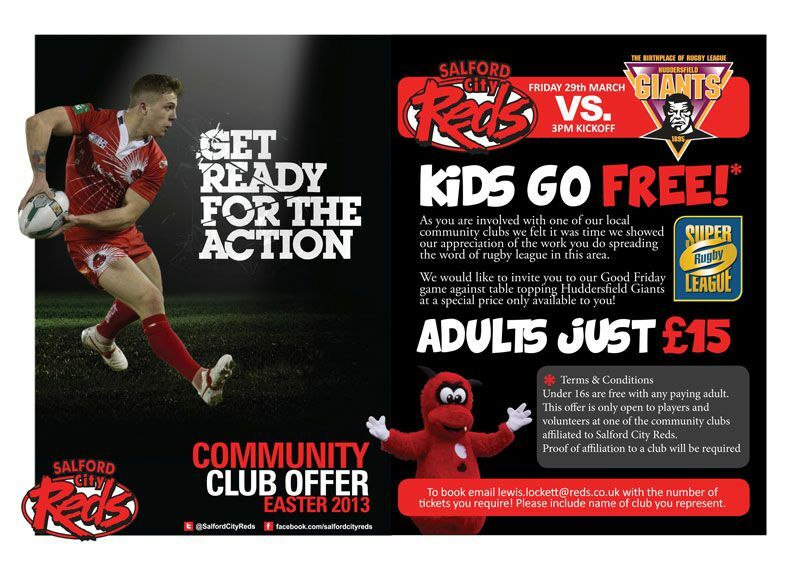 Salford City Reds are to welcome current Super League leaders Huddersfield Giants to the Salford City Stadium on Good Friday and would like to have as many local community club players, coaches and volunteers lending their support. There is lots going on within the Community Rugby League scene with established clubs such as Irlam Hornets doing very well in the winter leagues and the arrival of new junior clubs in the form of North Trafford Titans. Here at Salford City Reds we really appreciate the effort that goes in across Salford and the surrounding areas of Bury, Manchester and Trafford. As a thank you for all that great worl developing this fantastic sport of rugby league we are offering the chance for local club members to watch the Reds at a special adult price of £15 with kids under 16 going free.